(Photo) Gavin Christie, car #8, readies for his dash. 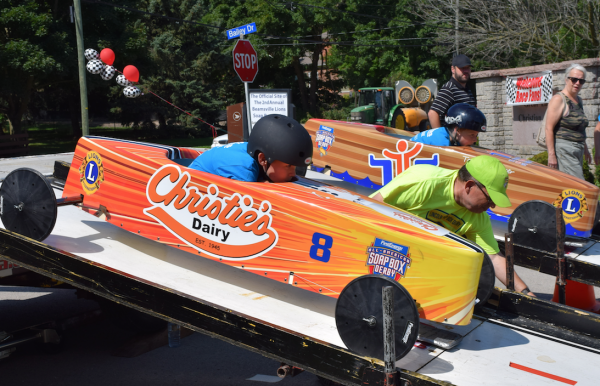 When the dust settled at Great Lakes Christian High School, Michael Cardozo was the Stock Car division winner in the Lincoln Soap Box Derby on Saturday (Aug. 11). It was the second annual event staged by Beamsville Lions Club. Other winners on the day were: Stock Car – First, Michael Cardozo; Second, Grier Cooper; Third, Cole Kingston. Little Rascals – First, Cole Fielding; Second, Ryan Arsenault; Third, Simon Habgood. Superkids – First, Kristopher Davies-Hales.